A bar encouraging patrons to grab a glass of wine and a paintbrush could soon be on the way for Ballston’s biggest new development. A new Muse Paintbar location seems set to be included in Ballston Quarter, according to new county permit applications. The bar’s listed address is on the first floor of 4238 Wilson Blvd, just down the block from the CVS pharmacy. Spokespeople for both Muse and Ballston Quarter’s developer, Forest City, did not respond to requests for comment on the matter. 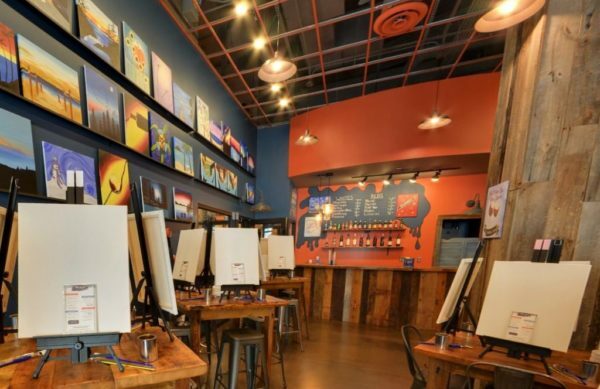 Muse dubs itself as “the premier paint and wine experience” on its website, offering events and private parties to help people learn how to paint while sipping on their adult beverage of choice. The chain has several locations around Northern Virginia, including ones in Falls Church, Woodbridge and Gainesville. Yet the bar’s opening could be a ways off — Muse only applied for a permit at the site on Wednesday (Sept. 26), with several rounds of review by county inspectors still on tap. The bar also has yet to apply for a permit to serve alcohol at the location, state records show. Ballston Quarter itself is set to open to patrons by the end of October, though Forest City has long said that the restaurants and businesses inside the new-look Ballston Common mall will open on a rolling basis over the next few months.